Ben Pope left Worthing Football Club after four years at Woodside Road earlier today. The former Brighton & Hove Albion youth player announced on Twitter he will not be returning next season. 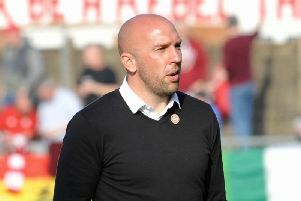 Worthing boss Adam Hinshelwood has moved quickly since the end of their Bostik League Premier Division campaign to get 11 players to agree to return for the 2018/19 season. However Pope will not be one of them and wrote on Twitter: "It’s a shame after 4 years at @WorthingFC I won’t be returning. Had some brilliant memories and learnt a lot at a club I highly respect. A huge thank you to everyone involved in my time at the club and wish you all the best for the future." Hinshelwood is due to sit down for discussions with the remainder of last season's squad who have not re-signed or left in the coming days.